Children living in Peasedown St John can look forward to four summer play days this Summer, thanks to the generosity of Peasedown Party in the Park and the village’s Parish Council. 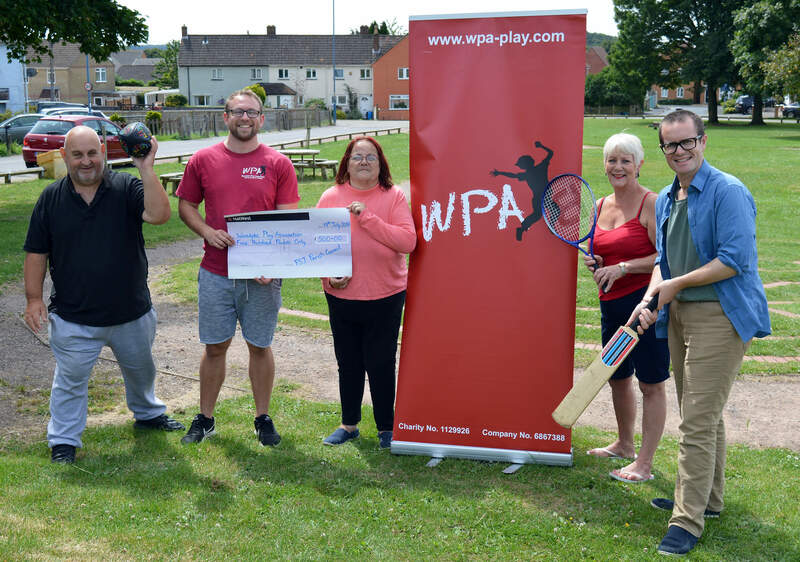 The Wansdyke Play Association, who have been running children’s outside interactive ‘play rangers’ sessions for the past 15 years, have been awarded £1,000. Peasedown St John Party in the Park, who run an annual Grant Fund to support community initiatives, gave the Play Rangers £500 in recognition of the positive impact they’re making on children’s lives. The Parish Council provided the other £500, which was awarded as part of the annual Community Grants Scheme. Cllr Mandy Clarke said: “We are really pleased to support these Play Days which provide some much-needed activity for children during the summer holidays”. All sessions are free, and Wansdyke Play Association will be delivering information leaflets to homes on the village throughout July. Pictured with Stuart Rouse, centre, are Party in the Park Committee Members Nathan Hartley and Karen Walker, along with Parish Councillors Mandy and Tex Clarke – who are the ‘link’ councillors for this parish council grant.